It was just over a year ago that I first visited the 9/11 Memorial, located on the site of the original World Trade Center. Despite living in New York my entire life, including attending graduate school in Manhattan, I had never gotten around to visiting the memorial until then. The memorial’s distinguishing feature is two acre-large footprints in place of where the Twin Towers once stood, composed of giant waterfalls into reflecting pools. Surrounding the pools are the names of all of those who died in the September 11, 2001 attacks, as well as the victims of the first World Trade Center bombing. That’s when I saw it. 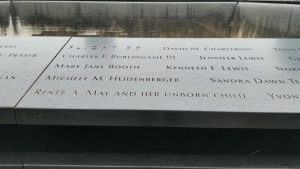 Every unborn child known lost on those horrible days is memorialized, despite not being included in the official death tolls. Although there is no equality under the law for the unborn, at the very least, it was right to call attention to their lives and what their deaths meant to the families who loved them. Tuesday night, the memorial proved a monstrous farce. The New York state Legislature passed one of the most sweeping abortion expansions in the country to mark the Roe and Doe U.S. Supreme Court decisions, which struck down abortion restrictions nationwide. To “celebrate” his signing the so-called Reproductive Health Act into law, Gov. Andrew Cuomo ordered multiple landmarks be set alight in pink, including One World Trade Center, presumably to honor (post-natal) women. 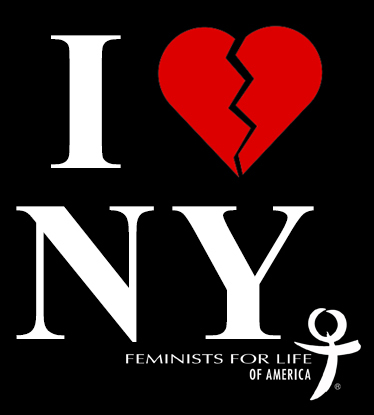 New York has long rejected the humanity of the unborn. Our abortion laws were loosened three years before Roe. But this law, which effectively expands abortion-on-demand from 24 weeks to birth, thanks to the new, ambiguous “health” exception for late-term abortions; allows non-doctors — including nurse practitioners, physician assistants, and midwives — to perform abortions; moves all abortion — including forced miscarriages — from the penal law to the public health law; declares abortion a “fundamental right,” imperiling conscience protections; and repeals protections for children born alive during botched abortions, sets the bar for disrespecting human life lower than ever before. 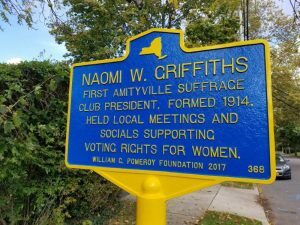 The Suffrage Trail of our feminist foremothers, who without known exception opposed abortion, runs through the Empire State: from Seneca Falls, where Elizabeth Cady Stanton and Lucretia Mott spearheaded the Declaration of Sentiments at the Seneca Falls Convention in 1848; to Rochester, where Susan B. Anthony worked tirelessly until her final days to gain equal suffrage for women, including being arrested for illegally voting in the election of 1872; to my own hometown of Amityville, where Naomi Williams Griffiths knocked on thousands of doors to convince local men to vote to give New York women the vote in 1917, eventually retiring to the very house in which I was raised, and where I still live today. More than 30 million baby girls have died in our country since 1973, and millions more women have been forever changed, including those who died as a result of legal-but-lethal abortion. To turn a memorial dedicated to thousands of born and unborn victims of terrorist violence into a pink monument to the killing of little girls — and boys — is the sickest of ironies. New York women and children deserve better. P.S. Situations like what is happening in my home state are exactly why we need your support now more than ever to help make abortion unthinkable. As the renaissance of first wave feminism, that includes educating the next generation about our pro-life feminist foremothers. We will soon be distributing “Voices of our Feminist Foremothers” brochures across the country, and we need your support. Please consider giving to this cause so that no woman, teen, or unborn girl or boy has to suffer as a result of the perversion of women’s rights to mean the “right” to abortion and infanticide ever again.